Book a skilled leaf removal expert in Kansas City. Backed by a total satisfaction guarantee and amazing customer support. What makes Kansas City a unique place? Is it because it spans across two states (Missouri and Kansas), or the fact that it has more barbecue restaurants per capita than any other city in the United States? Needless to say, Kansas City has its own distinct charm, and it is without a doubt one of the best places to work and live in. There are so many places to visit and things to do here, and you will want to have plenty of time on your hands so you can experience them all. If don't want to spend your weekend raking away the leaves on your lawn, then you may want to get in touch with Lawn Love because we are one of the best leaf removal services in town. The leaves that fall off from the trees during the fall season become scattered all over the ground and often leave behind a picturesque scene that is worthy of being made into a photo that you could proudly display in your living room. However, these leaves can actually cause you some problems as they are known to suffocate your lawn and prevent photosynthesis. Leaf removal is the only solution to this problem, and Lawn Love is one of the best when it comes to removing dried up leaves from your lawn. You can count on us to remove most of the leaves, sticks, and other debris from your lawn by the time we're done. 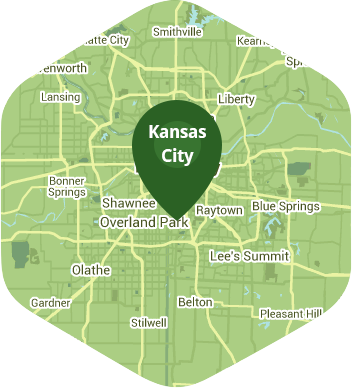 Book our services by calling us at 816-527-9015, or learn more about our rates by getting a free quote. Rated 4.75 / 5 stars in 2,040 Kansas City customer reviews. Dusk and dawn are the best times to water your lawn (the sun will rise at 6:29 AM and set at 8:04 PM today in Kansas City). Average lawn size 6,346 sq. ft.